Chicago:	Grove Parc Tenants Achieve Major Victory | Fight Back! Chicago, IL - “Homeland security arrests us ‘cause we are trying to stay in our homes. 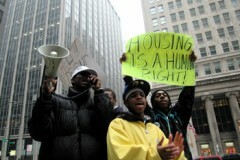 We told them, ‘Housing is a human right and we wasn’t goin’ without a fight!’” said Grove Parc tenant and Southside Together Organizing for Power (STOP) organizer Lonnie Richardson amidst cheers of tenants and supporters gathered on a cold November day outside the offices of the U.S. Department of Housing and Urban Development (HUD) in downtown Chicago. Tenants at Grove Parc Plaza Apartments, which sits in the shadows of the University of Chicago and the proposed site for the 2016 Olympic Stadium, have achieved a major victory in the struggle to stop their community of over 400 hard-working black families from being displaced. Since HUD threatened in 2006 to send Grove Parc to foreclosure because of failed inspections, tenants have been organizing to keep all 504 units subsidized and in the community. “I love this area. It’s close to transportation, the hospitals, museums, the parks,” says tenant Alberta ‘Peaches’ Morton. Tenant leaders spent countless hours educating their neighbors about the dangers of vouchers, which make many tenants have to move over and over again because most landlords won’t take them and if a landlord fails inspections the tenant is punished and forced to move. Rather than let the powers that be use false promises to take over the land, tenants got over half the complex to sign up for the Tenants Association and endorse a vision to bring in new owners and management, keep the project-based subsidies and give tenants access to the tools and support to turn around their community. They brought in a reputable non-profit developer called Preservation Of Affordable Housing, which committed to work towards the tenants’ vision and got the owners to agree to sell. But despite broad support of tenants, the community and elected officials, HUD rejected Preservation Of Affordable Housing’s first plan and pushed towards demolition, displacement and foreclosure. Refusing to give up, tenants took over the HUD office demanding an extension and a second chance for a good plan. “We had set up a meeting with the head of HUD. It got kind of heated and he said he’d see us in court and that’s when the rest of our people started pouring in and we said we weren’t going anywhere,” said tenant Sheila Rush. Following the sit-in HUD changed course and tenants received word that HUD had accepted a revised Preservation Of Affordable Housing plan. On Jan 15, Preservation Of Affordable Housing took over management - the first step towards turning around Grove Parc, preserving needed subsidies and stopping racial and economic displacement from valuable community land. With this victory, the Grove Parc Tenants Association, a member of STOP, has achieved a strategic win in the nationwide fight for the human right to housing. With HUD increasingly pushing vouchers and moving towards housing privatization and community displacement, Grove Parc is a battleground in the fight over the future of subsidized housing. The struggle is far from over and tenants are not letting up their guard. They are creating a decision-making agreement with Preservation Of Affordable Housing and working to ensure that the complex is brought up to code and that the right of return is guaranteed to current residents. “A lot of people underestimated us. We came together in unity, it wasn’t easy but we had to stay persistent and I’m just glad for the victory. We still have some things that we have to accomplish but we’re making progress,” says Faith McGhee, one of the leaders of the Grove Parc Tenants Association.